The Writers' Block (Tennessee) is piloting its first monthly Literary Pop-Up Shop in Bartlett, TN! On December 2, 2017, The Writers’ Block is launching its first Literary Pop-Up Shop in Bartlett, TN. I piloted the concept with the objective of bringing authors together with their audience. It is a book fair, meet-and-greet, mix and mingle, book signing event like none other. It will be held Saturday, December 2, 2017, at the Singleton Community Center, 7266 Third Road, Bartlett, TN 38135, from 12:00 PM – 5:00 PM CST! 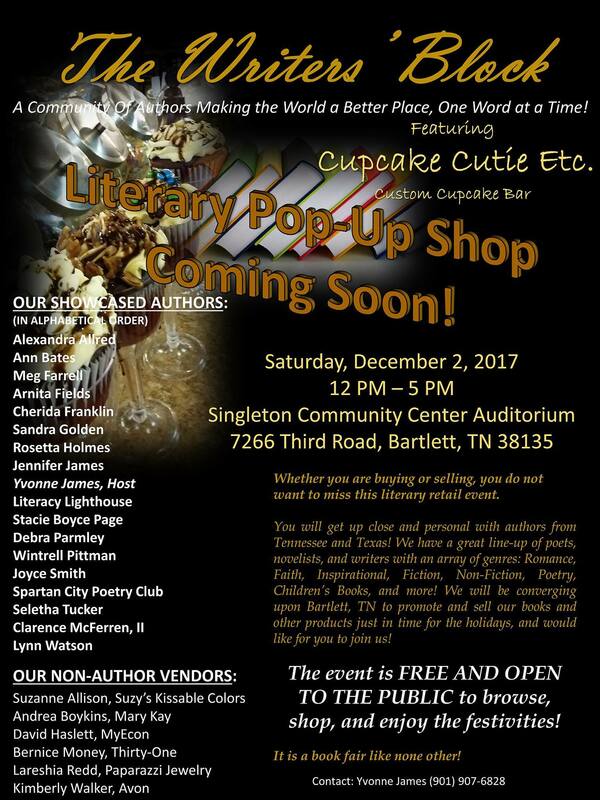 FREE AND OPEN TO THE PUBLIC, we have seventeen authors from Tennessee, Mississippi, and Texas with an array of genres; as well as, eight non-author exhibitors. We have something for the entire family – Romance, Devotional, Inspirational, Fiction, Poetry, Christian and Children Books. We are inviting the community to come out and support us – browse, $hop, mix and mingle, and donate just in time for your holiday shopping! The Literacy Lighthouse will be accepting donations of new and used children's books during the event! Our Author Showcase Includes (in alphabetical order): Alexandra Allred, Texas! Ann Bates, Mississippi! Meg Farrell, Mississippi! Arnita Fields, Tennessee! Cherida Lynn Franklin, Tennessee! Sandra Golden, Tennessee! Rosetta Holmes, Tennessee! Jennifer James, Mississippi! Yvonne James, Host, Tennessee! Clarence McFerren, II, Tennessee! Stacie Boyce Page, Tennessee! Debra Parmley, Tennessee! Wintrell Pittman, Tennessee! Joyce Smith, Tennessee! Spartan City Poetry Club, Tennessee! Seletha Tucker, Tennessee, and Lynn Watson, Tennessee! We also have representatives from Avon, Mary Kay, LipSense/SeneGence, Thirty-One, Paparazzi Jewelry, MyEcon, and Literacy Lighthouse as exhibitors! And, Cupcake Cutie Etc. a custom cupcake bar offering seven everyday cake flavors, nine different icings, a variety of fillings, and over thirty-five toppings!